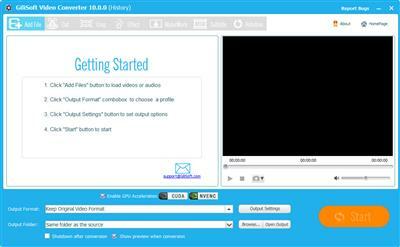 GiliSoft Video Converter is easy, fast, reliable, and loaded with features. It's capable of converting videos of all popular formats like AVI, MPEG, WMV, DivX, MP4, H.264/AVC, AVCHD, MKV, RM, MOV, XviD, 3GP, and audio MP3, WMA, WAV, RA, M4A, AAC, AC3, OGG. Now you can convert video, audio, andanimated images to play on your PSP, PS3, iPod, iPhone, Apple TV, Xbox, Google phones, iPad and other digital multimedia devices.